His Wild West Show Creates a Grand Sensation. The Eternal City is agitated from center to circumference. Buffalo Bill is there with his Wild West show, and the great throngs that visit it daily cheer the daring feats of the Indians, cowboys and marksmen to the echo. The papers of the city devote columns to descriptive and sensational details. 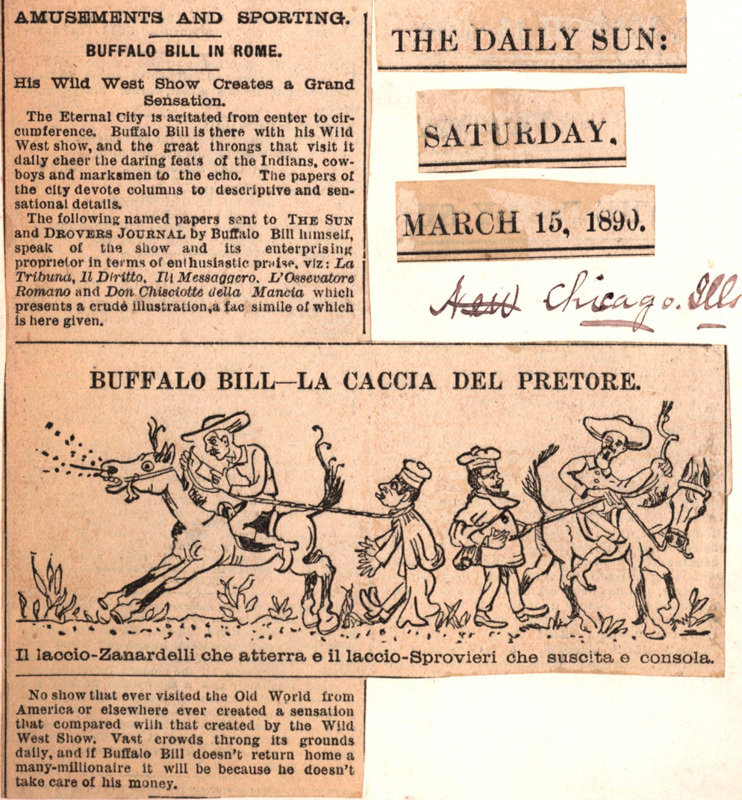 The following named papers sent to THE SUN and DROVERS JOURNAL by Buffalo Bill himself, speak of the show and its enterprising proprietor in terms of enthusiastic praise, viz: La Tribune, Il Diritto, Il Messaggero, L'Ossevatore Romano and Don Chisciotte della Mancia which presents a crude illustration, a fac simile of which is here given. 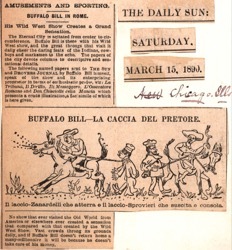 BUFFALO BILL—LA CACCIA DEL PRETORE. Il laccio-Zanardelli che atterra e il laccio-Sprovieri che suscita e consola. No show that ever visited the Old World from America or elsewhere ever created a sensation that compared with that created by the Wild West Show. Vast crowds throng its grounds daily, and if Buffalo Bill doesn't return home a many-millionaire it will be because he doesn't take care of his money.